South Korea’s overreliance on exports is its economic Achilles’ heel. As the year comes to a close and we take a moment to appreciate the many events of 2016, special attention must be paid to the South Korean economy. Sure, the presidential scandal is stealing the headlines but there might be something even worse lurking around the corner: an unprecedented economic slide. The scandals aren’t helping, of course, affecting currency exchange rates, stock prices, and the government’s ability to do business but that’s not where the real problem is. The real problem is in the fundamentals of the Korean economy. Let’s start with a simple analysis of what actually comprises the Korean economy. In 2015, about 46 percent of South Korea’s GDP was due to the export of goods and services. Let that number sink in for a moment. That means about half of Korea’s entire economy relies on exports. Believe it or not, this figure is actually down from the peak of 56 percent experienced in 2012. By comparison, only about 13 percent, 18 percent, and 22 percent of the U.S., Japanese, and Chinese economies depend on exports, respectively. All three of these latter countries have stronger domestic consumption to balance exports. The problem with a heavy dependence on exports is susceptibility to global competition. Although domestic markets can be protected in various ways, market shares in other countries are vulnerable to changing tastes, new competitors, and undercutting imitations that offer a similar product at a lower price. Usually, the only types of products to enjoy true longevity in foreign markets are regional specialties such as Italian art, civet coffee, or services like Swiss banking, things difficult to reproduce in another country. The unfortunate truth is that virtually all Korean exports are not of this category. The most prominent Korean exports in the last two decades have been electronics, automobiles, and boats. In the mid 2000s, Korea was a (if not the) global leader in each area. In recent years, however, Korean prominence has been significantly diminished across the board, in large part due to the emergence of Chinese companies who have caught up in expertise, now able to offer comparable products at a lower price in a growing number of markets. The effects of this competition have been most visible in maritime trade, where peer-reviewed research recently published by my research team has documented the global emergence of Chinese ports and shipbuilding companies, resulting in significant and ongoing redistribution of Pacific maritime trade in favor of Chinese infrastructure. One of the important aspects that gets missed about Korean exports is their overall lack of diversity. About 48 percent of all Korean exports consist of electronics and related components while 31 percent are transportation goods (cars, boats, and related parts). A game-changing shift in the playing field for any product area could spell a slow but steady downward spiral for the entire Korean economy. Even a 10 percent drop in exports would literally shrink the economy by 5 percent, costing tens of thousands of jobs that ultimately depend on export revenue, exacerbating the already high underemployment rate of 14 percent and youth unemployment rate of 9 percent. With a retinue of Chinese firms like Huawei and Oppo hot on the heels of Samsung, a potential decline becomes even more plausible considering the fact that Korean corporate culture is not always the most favorable for fostering the development of next-generation ideas and technology, often the easiest (and sometimes only) way for technology companies to remain competitive. This lack of forward thinking is most striking in the clean energy field, where Korea has been completely left out of the latest developments, despite its global reputation for being a technology powerhouse. Another key area of concern is corporate debt. South Korea’s total corporate debt is worth about 171 percent of its GDP. Although this high percentage is not unique to Korea (the U.S. and China have about 304 percent and 169 percent, respectively), Korea is more susceptible to adverse consequences for a number of reasons. The first is the high prevalence of “zombie companies,” corporate entities that have been unable to repay debt for at least three years running. It is estimated that about a quarter of all Korean corporate debt is held by zombie companies, unlikely to ever be repaid. This number continues to rise every year with the vast majority of money being owed to Korean lenders, both public and private. With high domestic reliance on these debts being repaid, a series of defaults could spell serious trouble. Thus far, most of the debt in danger of defaulting has either been financed with new debt or restructured, two activities that can not continue forever. Korean corporate giants are no strangers to debt either. Samsung, for instance, holds about $29 billion worth, equivalent to about 148 percent of its annual revenue. The reason why Samsung (or any other corporation) can borrow so much is because of the expectation of continued future earnings, something that is reflected in the stock price and often referred to as “leverage.” As mentioned above, if Chinese companies continue to chip away at those expectations even modestly, the size of Samsung’s debt relative to its annual earnings would increase, potentially prompting difficulty in making future payments and putting strain on the company’s ability to research, manufacture, and compete. A commonsense question that people usually ask at this point is: why are companies allowed to have so much debt to begin with? In the case of Korea, there are a few important factors that bear mentioning. The first is the economic boom of the late 1990s and 2000s. This period created a wealth of capital in Korea, money that begged to be invested somewhere. To promote investment domestically, the Korean government successively loosened lending laws so Korean companies could borrow more than perhaps they should have been allowed to. This loosening is one of the key ingredients that allowed for the creation of so many zombie companies, with eerie parallels to the bad debt that prompted the 2008 global meltdown. As I and others have mentioned elsewhere, a key problem with current Korean corporate culture is poor decision-making. The fall of Hanjin illustrates this well, demonstrating how unrealistically optimistic outlooks for future earnings by incompetent executives allowed Hanjin to borrow more than it should have, resulting in an inescapable debt trap. What is important to highlight is the way other corporations were also caught in the trap: most notably Korean Airlines, which was on the hook for about $340 million in uncollected debt payments from Hanjin. This result highlights the high frequency with which Korean corporate capital has been invested in other Korean corporations, creating a network of potentially dangerous interdependencies, relationships actively promoted by a domestic economic policy seeking to retain Korean capital in-country. A notable beneficiary of corporate lending for the last three decades has been the Korean real estate market. 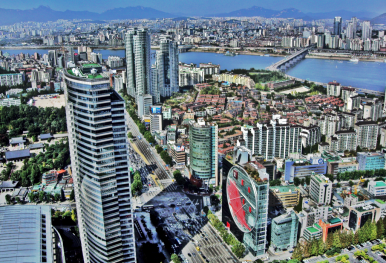 Another popular outlet for capital accrued in better times, Korea’s property market has witnessed the construction of hundreds of new apartment complexes, resorts, and luxury hotels. Companies like Lotte, SKT, and Hyundai, which traditionally had nothing to do with real estate, invested heavily in new property, many endowed with the corporate logo. This investment has continued in 2015 at a record pace, despite the fact there has been a serious housing glut in recent years with tens of thousands of apartment units remaining empty, prompting concerns about the inevitability of a substantial property bubble. Lending in the late 1990s and 2000s was not restricted to the corporate sector. Private lending was also an area significantly loosened, often to encourage property purchasing. In the last decade, average Koreans have been engaged in what can only be described as a borrowing binge. At the start of 2015, South Korea was one of only seven countries named by the McKinsey consulting firm to have unsustainable household debt. These reports, unfortunately, have fallen on deaf ears as Korea’s household debt has continued to balloon: from 84 percent of GDP in January 2015 to 90 percent by July of this year. By comparison, China has only about 41 percent household debt by GDP while Japan has 66 percent. When watching the current political scandals, one can only imagine how much incompetence and corruption might have been complicit in creating the various economic dangers outlined above. Taken together, the informed observer can only face the future with trepidation as it looks like a long series of dominoes have already been lined up, just waiting to fall. Will a new president be able to jump-start a sluggish economy? Can Samsung's Note 7 Discontinuation Shake the South Korean Economy?South Korea: Spring Jailed Tycoons to Save Economy?South Korea's Economy: Under Pressure? South Korea Joins the 5G RaceIs This the End of South Korea’s Semi-Charmed Export Life?